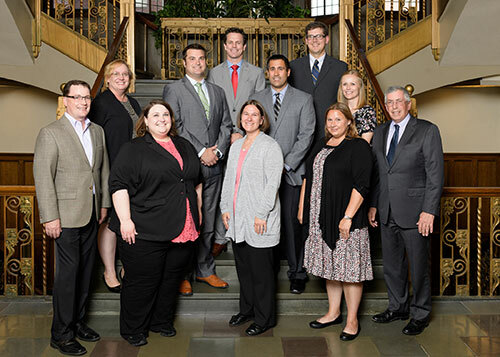 Purdue University College of Veterinary Medicine Assistant Director of Financial Affairs Samantha McFarland is one of eight University managers recognized for completing Purdue University's Council for Manager Development (CMD) program. As published in the October 11 issue of the Purdue Today e-newsletter, the CMD program is a two-year professional development experience designed for managers to enhance their leadership skills, increase their knowledge of the University and its functions, network with campus leaders, and elevate their teaming skills as they work toward a common objective of completing a campus project. Some highlights from the 2017 cohort's program include: leading a Six Sigma project for the Transform Purdue initiative; job shadowing and job rotation experiences; and giving a presentation on a project titled "Bridging the Gap: Software Training and Development for Purdue Students," which serves as a basis for offering Lynda.com to Purdue students. Samantha's responsibilities as assistant director of financial affairs, a position she has held since 2014, include supporting the College of Veterinary Medicine's associate dean for research, associate dean for engagement, and the directors of the Center for Comparative Translational Research, Equine Sports Medicine Center, Center for Paralysis Research, Lifelong Learning, Alumni Relations and Special Events, Advancement/ Development, Communications, and Web Communications. The CMD program is sponsored by the Purdue University treasurer and chief financial officer. Participants are accepted into the program through a competitive process. For additional information on the program, contact Charlyce Patterson, senior talent management specialist in leadership and organizational development in the Office of the Vice President for Human Resources.